Have you ever taken a shortcut? How did that work out for you? Not too well? Has it ever worked? Too often, shortcuts end in disaster. I remember the day before I got married, we were having a wedding rehearsal. The ushers we had were a father and step-son, from Arkansas. We all left Pryor for Miami, we get to the church, and everyone was there in short order, except the ushers. When they finally arrived, I was informed that the dad thought he knew a shortcut to Miami. Didn’t work out that way. I’ll never forget, when the wife/mom walked in, the first thing she asked me was, “Do you do divorces?” She was unhappy with her spouse. That’s usually how shortcuts work. We try the shortcut and it ends up being a dead-end road or a two-lane road with heavy traffic so it’s no shortcut at all, and it actually takes you longer to travel. What about a shortcut when you’re trying to fix something at home or on the car? You think you have a great idea, and you think it is fixed, but then it breaks again and costs more to fix this time! Shortcuts don’t usually work. In the Old Testament lesson today, we see Abraham trying to help God out with a shortcut. 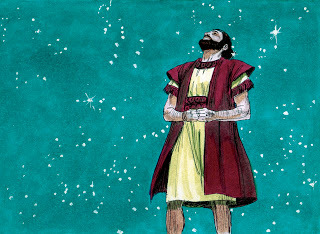 God had told him years earlier that his descendants would be as many as the stars in the sky. But now it is years later, and Abraham and Sarah still have no child. Abraham wants to do things his way. He’s figured out a way to have an heir. After all, he’s ninety-nine years old. Sarah is 89. He and Sarah are not going to be having children. It’s just too late. So, Abraham has a plan for an heir and even God can save face. In the chapters before our text, Sarah had the brilliant idea (sarcasm) that her husband should take her servant girl, make her another wife, and then they can have a child with her. Abraham’s response to this was: “Uh, ok.” And when Hagar gives birth to Ishmael, she starts being rude to Sarah. You know, “I did something you can’t do.” Sarah throws Hagar out, but God told her to go back. A few years later, Abraham and Sarah still have no heir of their own. Abraham wants Ishmael, his son by Hagar, to be his heir. Ishmael is already born. Abraham loves Ishmael. He practically begs for this, praying to God, “Oh that Ishmael might live before you!” (v 18). (This is a couple of verses after our text.) He knows he and Sarah are too old to have a son, so just make Ishmael heir of the promises. This is Abraham’s wish and his answer to his problem. That’s the shortcut. We operate the same way. We have problems in life. Everyone does. We, as the people of God, go to Him in prayer. You pour out your heart to Him. You tell Him you believe in His promises. As soon as you pray “Amen,” you start looking for your own solutions, your own answers, the way you think the problem should be solved. Just like that, you’ve got worry, fear, anxiety. Give it to God and then take it right back just as fast as you can. The real problem here is that you don’t trust God and His ability to answer the best way for you. You want to do it. After all, you might not like God’s answer and His solution. Just like Abraham! So thirteen years after Ishmael is born, God comes to Abraham face-to-face. God does not come to yell at Abraham or chew him out. God comes to Abraham to strengthen his faith by speaking to him and reminding him of the promises of the covenant. If Abraham thought it was impossible, unbelievable, that he and his wife could have a child in their old age, he must have been astonished at the unbelievable promises that God made to him. He changed Abram’s name to Abraham. Why? He would become the “father of a multitude of nations.” Sarai was changed to Sarah because she would be the mother of many nations. God would not work this promise through Ishmael, but He would keep His original promise by giving Abraham and Sarah a son of their very own even in their old age. God was going to work two miracles. First, Abraham would have his son with Sarah. When Isaac was born, Abraham was 100, Sarah was 90. You know anyone 90 years old who just had a baby? And things weren’t different then in this regard. I know some people lived longer, but women didn’t have babies in their nineties. Not at this point of the Biblical narrative. So that was one miracle. Second, God would make that child very fruitful and make him literally into many nations. God was going to bless Abraham with descendants, generation after generation. In fact, God would bless him so that this would be an everlasting covenant. The covenant would be everlasting because of one of those descendants. Human beings each have their own life expectancy, a beginning and an ending, about 80 years give or take. To be an everlasting covenant would take a special descendant who would be like Abraham, a human descendant, but also God, who has no end, who is everlasting. And this was, in fact, the case. One of Abraham’s descendants would be the Savior, Jesus Christ. Oh, and one more thing. God also gave to Abraham the land of Canaan, literally the Promised Land for his future descendants. Jacob and his family moved to Egypt, but Moses and Joshua led them back hundreds of years later when there was a million of them. And they ended up living in that Promised Land. This Promised Land would be an everlasting possession. Again, it would be everlasting because there would be a land far beyond anything on earth. There would be a Promised Land that would last forever. God is referring not just to Palestine here, but heaven. God fulfilled His promises to Abraham and Sarah, and, in doing so, He has kept His promises to you and to me. Jesus Christ, the descendant of Abraham, has come. And there were no shortcuts here, I’ll tell you. The way God picked to save us was not cheap. It was not easy. Jesus has come for all people, all nations, all generations. He came to bring the promises of God to ultimate fulfillment. He did so to remove the sins of our weak faith, our doubts, our constant desire to do things our way, to solve problems without regard to God’s will. He did so by His own suffering, His own shed blood to cover our sins, His own death to pay our wages of sin, and His resurrection to conquer death itself. Through Jesus Christ, the promises of God to Abraham and to us are fulfilled. By faith in Jesus, we, too, are now descendants of Abraham. We do not have his DNA, per se, but we are spiritual descendants. And like with Abraham, God has changed your name too. At the day of your Baptism, the day you received the Holy Spirit, the day you got faith, the day your sins were forgiven, the day you became an heir of eternal life, God gave you a new name: Christian. He keeps His promises to you. He gives you “a new covenant in his blood, given and shed for you for the forgiveness of sins.” His covenant, sealed in His holy, precious blood, strengthens your faith and keeps you in faith to life everlasting in the everlasting Promised Land. Time to put this all together. God made promises to Abraham. The promises seemed impossible, unbelievable, to an old man and his wife. But God Kept His Unbelievable Promises to Abraham, and He has done the same thing for us! All the promises were fulfilled in Jesus Christ when He came for you and me. Now we have new names, forgiveness of sins, an everlasting covenant, and a promised land. These are indeed unbelievable promises. And God didn’t take any shortcuts to save us. Adapted from Concordia Pulpit Helps, Vol. 28, Part 2.